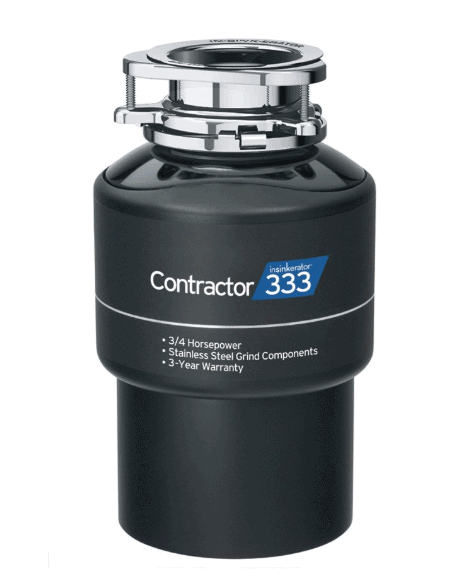 Contractor 333 is a new addition to the long line of InSinkErator disposals, it replaces the old Pro333 disposal. Though belonging to the Badger line its name doesn’t indicate that. Powered by a ¾ HP motor it offers strong competition to InSinkErator’s own Badger 5XP. Both are similar but Contractor 333 is much better looking. During my research, I found that some information regarding this disposal in many websites including Amazon.com and InSikErator.com are wrong, so if you find any information different on any other portal do not worry, just check its spec sheet and warranty info. The 3/4Hp motor drives the disposal to 1725RPM. It has a chamber capacity of 26oz with overall dimensions 12 5/8” x 6 ¾”. PS: The dimensions given in Amazon.com at the time of writing this review is wrong, pls refer the spec sheet here. It uses a 3-bolt mount which has a Quick Lock System (Found on all InSinkErator models) for easy installation. It also comes with a stainless steel stopper and a preinstalled power cord. Its build is impressive; I like the overall look of the disposal. It is compact and stylish. Its grinding chamber and grinding components are made of stainless steel, so I should add this to my list of ‘stainless steel garbage disposals’. 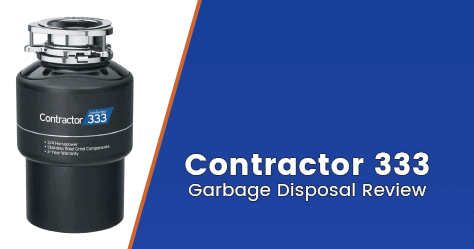 InSinkErator Contractor 333 is a continuous feed garbage disposal. It has only a single stage grinding, at this price they should have included a 2-stage grinding system. There are some garbage disposals offering fierce competition to Contractor 333. Badger 5XP, as mentioned before, and Waste King’s L-3200 are among the top. The main advantage of Contractor 333 over the others is its build quality. But Badger 5XP and Waste King L-3200 are much cheaper and offer the same performance. If you stress on build quality the Contractor 333 is a good choice but otherwise, go for the other two. Can I replace my InSinkErator Pro333 with Contractor 333? Yes, absolutely. Contractor 333 is a perfect replacement for Pro333. Does this one come with a power cord? Yes, unlike most InSinkErator disposals this one comes with a preinstalled power cord. Does this one have a removable splash guard? It comes with a splash guard but it is not removable unless you dismount the whole disposal. It uses a 3-bolt mount so it is not possible to remove the splash guard.